Shinydashboard 0.6.0 is now on CRAN! This release of shinydashboard was aimed at both fixing bugs and also bringing the package up to speed with users’ requests and Shiny itself (especially fully bringing bookmarkable state to shinydashboard’s sidebar). In addition to bug fixes and new features, we also added a new “Behavior” section to the shinydashboard website to explain this release’s two biggest new features, and also to provide users with more material about shinydashboard-specific behavior. 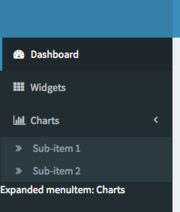 This release introduces two new sidebar inputs. One of these inputs reports whether the sidebar is collapsed or expanded, and the other input reports which (if any) menu item in the side bar is expanded. In the screenshot below, the Charts tab is expanded. These inputs are unusual since they’re automatically available without you needing to declare them, and they have a fixed name. The first input is accessible via input$sidebarCollapsed and can have only two values: TRUE, which indicates that the sidebar is collapsed, and FALSE, which indicates that it is expanded (default). The second input is accessible via input$sidebarItemExpanded. If no menuItem() in the sidebar is currently expanded, the value of this input is NULL. Otherwise, input$sidebarItemExpanded holds the value of the expandedName of whichever menuItem() is currently expanded (expandedName is a new argument to menuItem(); if none is provided, shinydashboard creates a sensible default). As usual, you can view the full changelog for shinydashboard in the NEWS file.